My studio clean up is moving slowly. I decided to begin with cleaning and organizing pastels. I usually work on 2 or 3 paintings at a time, rotating between them as my interest ebbs and flows. Each painting has its own palette (selection of colors and values), so little piles of pastels accumulate as I work. They get dirty from being piled up next to each other, from my fingers as I transfer from color to color, and from pastel dust falling from my easel. My ideal is to clean up as I go along. I am meditating on that goal while engaged in this current massive clean-up project. Dakota Art Pastels sells an Artists's Air Filter System that hooks onto the bottom of the easel and costs $1449. I do not have one of those. I do have a vacuum cleaner and access to rags, water and a pail. Barbara Newton recently blogged about her Cherry Pastel Cleaner. They cost $89. I do not have one of those. 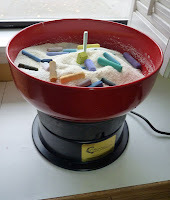 I use the low-tech/low-cost method of putting pastels in a box of cornmeal and shaking them around to get them clean. A couple years ago I suffered a serious lung problem that kept me out of the studio for almost a year. Although it was not attributed to inhaling pastel dust, my pulmonologist and an occupational health specialist instructed me to use an industrial face mask while painting with pastels. I wear it whenever I'm in my studio, especially during clean-up. It fits tightly and leaves marks that blend in nicely with my laugh lines. When things are going well in my studio, I am very happy. I don't generally laugh in my studio unless something funny comes on the radio, but my heart often beats with joy and contentment. My 7-year-old grandson has a great sense of humor. A couple months ago he mailed me these jokes: Q: Why was the art dealer in debt? A: He didn't have any Monet. Q: What did the artist say to the dentist? A: Matisse hurt. Q: What is red and smells like blue paint? A: Red paint. Now I'm laughing! Love the jokes from your grandson. Precious! Cleaning up the studio is always a big chore, but worth it in the end! As soon as it's done, it's like a new canvas -- time to get busy and PAINT!! Thanks for checking in, Katherine! Blake absolutely loved sending you those jokes. He chose them specifically for you from an "Art Jokes" website. Blake loves the idea of making people laugh ;). He also loves the way you look in your mask. Blake loved those jokes. He picked them specifically from an "Art Jokes" website for you. He loves making people laugh! He also loves giggling when he sees you in your mask :). He's such a loving and thoughtful little guy. I love making him laugh, too, so we're mutually enthralled with each other I guess! Such are the wonderful roles of grandparent and grandchild! Someday you, too, will experience this, Marie!